You may find it a little confusing to differentiate between software upgrades and patches. For example, when do you need which one? When is there a fee for a software release, and when is a release free of charge? With the recent release of the new CR300 datalogger, Campbell Scientific rolled out new versions of several software products. To help you understand how these new software offerings may benefit you, I'll explain the differences between Campbell Scientific's software upgrades, patches, and trials. But first, I'll quickly review our software version numbering, which plays a key role in determining whether you need an upgrade or a patch for your software. When we release a new software product, we usually start with Version 1.0. (Seems like a good place to start!) For Version 1.0, “1” is the major version number, and the “0” is the minor version number. As we make small, incremental improvements to a product, we may release Versions 1.1, 1.2, 1.3, and so on. Each of these subsequent releases is said to have a minor version number of 1, 2, 3, etc. If we make substantial changes to a software product, we may increment the major version number. Thus, our Version 1.3 becomes Version 2.0. You can obtain a product upgrade when you currently own a licensed copy of our software and a new release changes that product's major version number. For instance, in the example above, the major version number changed from 1 to 2 (Version 1.3 to 2.0). To get the new software version, you typically place an order for an upgrade (for a fee). Many of our software products are available for on-line distribution, and you can download and install the upgrade after the order is processed. 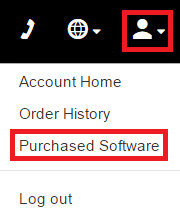 When you log in to our website, visit the Purchased Software section of Your Account page. On the Purchased Software page, you will see a list of all the software licenses that are specifically assigned to you and have been purchased by your organization since 2006. Note: There may be other software licenses that are assigned to other people in your organization. If so, they will not appear on your list. If you need to have one of your organization’s licenses reassigned, contact Campbell Scientific for assistance. Sometimes, it’s not necessary for you to purchase an upgrade for your software. For example, there may a patch that you can use, which is free of charge. Patches are software installations that update your software version to a higher minor version number. The installation for a patch searches your computer for a major version number that matches the major version of the patch you are trying to install. If the version is found, the installation proceeds to update the software on your computer. If the version is not found, the installation stops. Patches are free of charge. If a patch is available for a software license assigned to you, you will see a button to download the latest patch on the Purchased Software page. If you are curious about a specific piece of Campbell Scientific software, but you don’t own a licensed copy yet, you may be able to get a trial version. Software trials provide a "try before you buy" opportunity for our software. Trials are fully functioning versions of the software, but they are truly 30-day trials and stop running 30 calendar days after you initially install them. Tip: It's important to install a trial version when you will have plenty of time to evaluate the software because there is no way to reset a trial after it has expired. On your computer, trial versions of our software are installed in a different directory from our licensed versions of software. This lets you install a trial version without affecting a current version that you may have installed. Because of this, however, if you install a trial version and then desire to install a licensed version, the trial version must be uninstalled first. The good news is that any work you have done using the trial version is left intact when the trial is uninstalled. Thus, once the licensed version is installed, you can pick up where you left off with the trial. 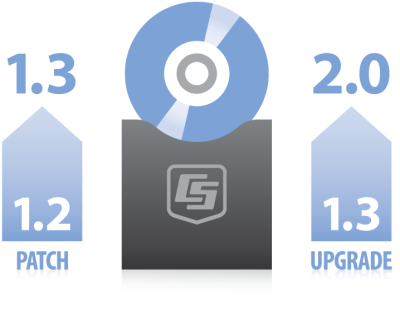 Upgrades enable you to upgrade an older, major version of software with the newest release. These releases often contain significant changes or feature enhancements to the previous version of software. Typically, you must purchase upgrades from Campbell Scientific or one of its representatives. Patches are incremental updates to software within the same major revision number. Patches are available free of charge, and you can download them from our website. Trials let you try out our software for 30 days, so you can determine if the program meets your needs. Trials are available free of charge by downloading them from our website. After trials expire, they cannot be reset. New upgrades, patches, and trials are currently available for LoggerNet 4.4, RTMC Pro 4.3, CSI Web Server 1.4, Short Cut for Windows 3.2, and Device Configuration Utility 2.12. These new releases support the CR300 datalogger, but there may be other enhancements that are of interest to you. Check out the revision history available on our website to learn what's new in each of these, and other, product releases. I hope the information in this article has helped clarify the role of version numbering in our upgrades and patches, and the difference between our various types of software releases. If you have any questions or comments about software upgrades, patches, or trials, post them below.